Last Labor Day weekend, I had an unplanned get-off on my 1996 R 850 R.
It happened while going around a corner with a diminishing radius turn and severe road surface damage. I walked away with a broken left clavicle and four broken ribs. After surgery and three-month recovery I got back on the bike, but things didn’t feel right. I felt awkward and was nervous. I knew I needed training. I decided the best place to start would be the beginning. I’ve never had any formal training when I started riding so I wanted a fresh start and to learn properly from the ground up. I enrolled in a Motorcycle Safety Foundation Beginning Rider Course. I chose a weekend, filled out the online forms and began the three hours of online coursework. Beginning with the basics including the parts of the motorcycle, I also learned about more complex concepts such as turning and braking. While all good information for a newbie, I wondered if I had chosen too simple a class. The weekend of the class we met at the Albuquerque BMW dealership at 5:30 p.m. There were six students and only two of us with any riding experience. Beginning in a classroom, our lessons involved some of what was covered online as well as situation identification of intersections and roads and discussing problems, determining potential escape routes and what our actions might be. We also discussed accident survivability, gear vs. no gear, and the stupidity of drinking and riding. After five hours, we were dismissed and instructed to meet at the range the next morning by 7:30 a.m. It was chilly the next morning as I stood with five other students in front of a collection of 250cc motorcycles. 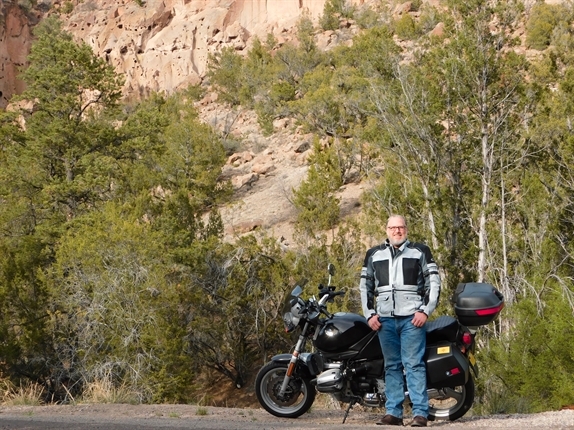 After I picked out a sleek, gray Suzuki TU250x, I was ready to roll. Except, we didn’t roll. First, we discussed the parts of the motorcycle and how they worked. Then, we learned the proper way to mount a motorcycle – from the left side with our right hand on the front brake lever. With those steps completed, we could then swing a leg over. From there we learned how to use the clutch correctly and how to get the bike into neutral and finally, how to start it. Our repeated actions lead to skill proficiency and also to the development of muscle memory. I reminded myself that this was a beginner course and my goal was to learn from the ground up. Ready to move to the next phase, we started the bikes and practiced working within the friction zone and before long, we finally got to ride across the range. Seeing the new riders displaying their new skills proved how well this program works. Then there was me who, with 35 years of riding, just wanted to relearn the right way. The rest of the day was spent repeating progressively more challenging skills. Our final day reinforced what we had already learned while adding new skills involving turn situations. This was where I realized the bad habits I developed over the years. Working with our coach, we spent a lot of time on the course making sweeping turns, tight turns, U-turns, and more. We also practiced obstacle avoidance drills, lane changes with signal and head turn as well as emergency braking. A couple of bad habits I had been using over the course of my 35 years of riding opened my eyes. I learned I tended to lean to my right when stopping and taking my foot off the rear brake pedal too soon while not allowing me to use my right hand while keeping the bike still and the brake light on. I also learned I wasn’t using good clutch control in turns and that I use some racing techniques in turns that are not part of the MSF course. At the end of the day, we all passed. I realized I fixed some bad habits and learned some better techniques. If you have never taken any training I recommend starting at the beginning. I plan on continuing with other courses with the MSF, and other training centers. I also highly recommend applying for a Paul B scholarship through he MOA Foundation to become a better and safer rider.